Fiddler Rodney Miller is joined by guitarist David Surette and pianist Gordon Peery for the final program of the Hancock summer bandstand concert series. The concert is on Thursday August 14th and starts at 7:00 on the Hancock NH Common. This concert is free and open to all. The trio will perform a concert of Celtic and New England fiddle tunes. Rodney Miller was designated a “Master Fiddler” in 1983 by the National Endowment for the Arts. He is widely considered to be the foremost exponent of New England style fiddling, a uniquely American blend of French Canadian and Celtic influences. Over the past 35 years, he has toured the U.S., British Isles, Australia and Denmark, performed and taught at hundreds of music and dance festivals, and recorded over ten fiddle albums. In 1999, Rodney represented the state of New Hampshire, playing traditional fiddle music at the Smithsonian Folklife Festival in Washington, D.C. He has also appeared on Garrison Keillor’s National Public Radio show “A Prairie Home Companion,” performed live with the Twyla Tharp Modern Dance Company, performed at the Lincoln Center in New York, and was recorded on the album Songs and Sounds of the Sea for the National Geographic Society. Most recently, Rodney has been named New Hampshire Artist Laureate, a two-year position bestowed by Governor Maggie Hassan. David Surette is regarded as one of New England’s most accomplished guitarists in the folk tradition. His solo albums “Back Roads” and “Trip to Kemper” have to establish him as a top player and arranger of Celtic fingerstyle guitar, yet his diverse repertoire also includes original compositions, blues and ragtime, traditional American roots music, and folk music from a variety of traditions, all played with finesse, taste, and virtuosity. He also plays regularly with fiddler Rodney Miller, with whom he performed at the 1999 Smithsonian Festival of American Folklife, and with whom he has released two recordings. In addition to performing and recording, David maintains an active teaching schedule, and is head of the folk department at the Concord (NH) Community Music School. Gordon Peery is known for his energetic and orchestral style of piano accompaniment for New England contra dance music. His playing has taken him throughout Europe, and, with Rodney Miller, he participated in the 10th Annual Shetland Islands Music Festival in 1987. He had the privilege to perform with the Irish band The Chieftains at Avery Fisher Hall at Lincoln Center, but considers it an equal honor to share the stage with a variety of local musicians at the regular Nelson Monday night contra dance. While Gordon and David have both played individually with Rodney, their performances as a trio are rare. They are looking forward to the summer evening setting of the Hancock bandstand to deliver a performance that will have a delightful blend of polish and spontaneity. On Friday June 13, Federated Church of Marlborough is hosting Tracy Grammer and Jim Henry. The concert is at 7PM. Tickets are $15 reserved and $20 at the door. Toadstool in Keene and Peterborough have tickets, or they can be reserved by calling the church office 603-876-3863. On tour in early May to celebrate their latest album, “Abundance,” Scottish fiddler, Alasdair Fraser, and cellist, Natalie Haas, will be performing in downtown Brattleboro at the First Baptist Church on Sunday, May 4. Theirs is a concert that spans the courtly traditions of Scottish music to the boisterousness of the pub with haunting Gaelic laments and airs, raucous dance tunes and improvisations based on traditional and recently composed tunes. Acclaimed worldwide, these two consummate performers are passionate and spellbinding. They have an expressive palette and stunning technical range. The duo carries on musical conversations that weave around each other, support one another and playfully exhort and entertain each other and their audiences. Fraser is recognized as one of the finest fiddle players Scotland has ever produced and tours and leads workshops and performs with cellist Haas all over the world to great acclaim. Their concerts in Brattleboro are especially meaningful to them because of the community of kindred spirits in this area. This is a concert that will leave you entertained, inspired and uplifted. TICKETS: $18 in advance, seniors / $21 at the door. For on-line purchase: BrattleboroTix.com. In person, Everyone’s Bookstore, 25 Elliot St., Brattleboro VT; The Toadstool, Colony Mill in Keene NH; World Eye Bookshop, 156 Main St., Greenfield MA. The Brattleboro Music Center’s 7th annual Northern Roots Traditional Music Festival will take place on Saturday, January 25th. This day-long celebration brings together local and regional musicians representing various northern musical traditions including Irish, Scottish, Scandinavian, English and French Canadian.The Northern Roots Festival begins with a full slate of daytime participation and performance activities, including workshops, panels, mini-concerts, pub sessions, dance band prep, and a family dance. The festival concludes with an evening performance featuring musicians representing the best of the northern musical traditions. When: Doors open at 2 PM, 20 October, 2013. Jam begins then and concert begins at 3:30 PM, dinner at 4:30. Concert resumes a decent time later followed by more jam. On Saturday, September 7th at 7pm the Mariposa Museum will host acclaimed interpreter of English and American ballads and songs, Dr. Tony Barrand performing “John Barleycorn Must Die—Songs to Bring the Harvest Home.” He will be accompanied by premier accordionist, Dr. Paul Eric Smith. Why is Barley the monarch of all the grains? Because it’s the key ingredient of home-brewed ale. Would you like to know how bread is made? Bread is made of wheat, (and also oats and rye) after the grains are ground “betwixt two stones” at the mill into flour. Bread and Beer were and still are the staples of the country diet. Personified as the rich man, the dancing girls, the miser and the King, the grains — that die in the fall as they are cut down each harvest and then are reborn after planting in the spring — have inspired countless songs about the common effort to “bring the Harvest Home”. Many of the songs Tony and Paul Eric will sing have choruses that will be taught to the audience. Everyone will be encouraged to join in the singing with words provided in a special program. Dr. Tony Barrand, widely acclaimed interpreter of English and American ballads and songs, is a Professor Emeritus of Anthropology from Boston University, where he taught the folklore of dance and song and seasonal customs. He is probably better known, however, as part of the singing team John Roberts and Tony Barrand who have delighted audiences across the USA for almost three decades with their “a capella” duets of English folk bawdry and balladry, morris and clog dancing, monologs and storytelling and perhaps best known locally for the popular annual Christmas pageant, “Nowell Sing We Clear” More recently he biggest music project, in a collaboration with his neighbors with Keith Murphy and Beck Tracy, is a set of Vermont songs collected by Margaret MacArthur in the 1970s and by Edith Sturgis in 1919. His collection of films and videos of Morris, sword and clog dancing was recently acquired by the Archive of American Folk Culture at the Library of Congress. Admission to the Tony Barrand concert: Adult $12, Member $10. Mayfly is Katie Trautz and Julia Wayne. You may remember Katie appearing as part of Wooden Dinosaur a few years back. We tried to get Mayfly to Nelson during the month of May so you’d know how on top of things we are, but it wasn’t to be. Join us on Friday, October 11 at 8:00 PM in the Nelson Town Hall for a concert of traditional and original music. Admission is $12/$9(Sr/Jr). Mayfly, Americana/Old-time duo, is a Vermont based band that performs old-time New England and Appalachian music, as well as original songwriting on guitar, fiddle, mandolin, banjo and vocals. Mayfly has been performing for over 10 years, touring throughout the USA and Canada. The girls have two albums, one of which won ‘Best Traditional Album of the Year’ in Vermont. 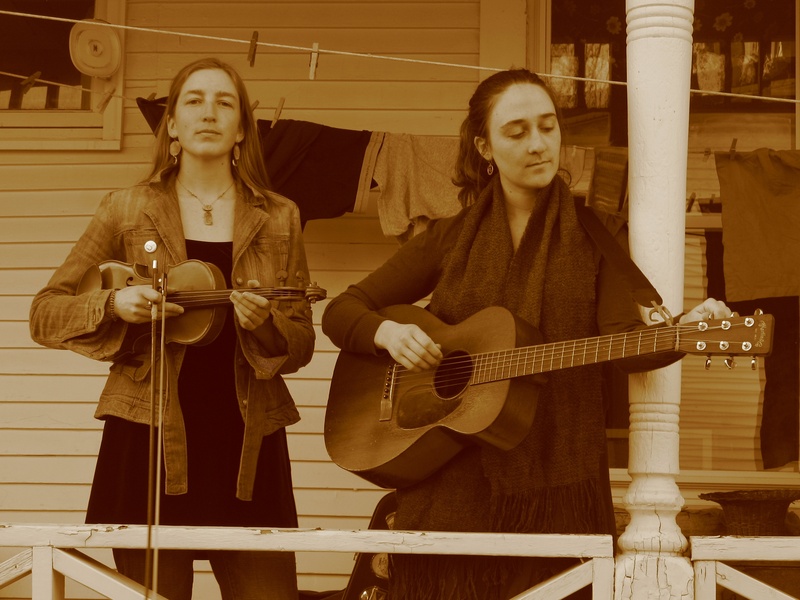 Mayfly intersperses close harmony vocals with strong instrumentals influenced by blues, ballads, and American roots music. The duo has performed alongside renowned traditional musicians from across the globe, including Swedish fiddler Anna Lindblad, Louisiana based musician Dirk Powell, and North Carolina’s Riley Baugus. Mayfly has also shared the stage with Crooked Still, Avi and Celia, David Boulanger, Sheesham and Lotus, Crowfoot, Pete Sutherland and other great bands and musicians at festivals in New England and Canada. Mayfly will be celebrating the release of a third album in the summer of 2013. The First Church in Jaffrey invites the public to its third annual Scandinavian Midsummer Celebration with traditional music and dancing around the Midsummer Pole on Saturday, June 22, from 10:30 a.m. to noontime, on the Meetinghouse Common in Jaffrey Center at Laban Ainsworth Way and NH Rte. 124. The First Church Midsummer Celebration will again be led by noted fiddler, soprano, and folklorist Andrea Larson, who loves the Scandinavian traditions of folklore and music. Andrea Larson has performed Swedish folk music and dance in theaters, museums, churches and schools in the U.S., Great Britain and Sweden. She teaches violin at her home in Wilton, NH. First Church Minister of Music Gene Faxon will accompany her on accordion. The Rev. Robert R. Kyte of First Church will welcome the gathering. The Finnish folk dance group Revontulet from Fitchburg, MA will perform inside the Meetinghouse for the second year. “Revontulet”, meaning Northern Lights, has been performing for more than 50 years, dedicated to the promotion of Finnish dance traditions. The dances, music and traditional dress are those worn in Finland during the 18th and 19th centuries. Midsummer celebrates the summer solstice, when daylight lasts until late in the evening. In parts of Northern Europe the sun never sets this time of the year. On Midsummer Eve, each community will raise a Midsummer Pole decorated with birch branches and wildflowers. Families gather to enjoy an afternoon of traditional music and dancing. First Church parishioners will raise the Midsummer Pole on the Meetinghouse Common in front of the First Church in Jaffrey, which is two miles west of the junction of Routes 202 and 124 in downtown Jaffrey. Wildflower wreaths will be available for people to wear. There will be live music and dancing, and cookies and lemonade will be served. In the Swedish tradition, First Church on Sunday, June 23 will celebrate St. John the Baptist Sunday, commemorating the date of his birth in the church calendar.